Dutch caretaker finance minister Jeroen Dijsselbloem is to stay on as chairman of the influential Eurogroup of finance ministers until January next year, even though he will no longer be a minister by then. 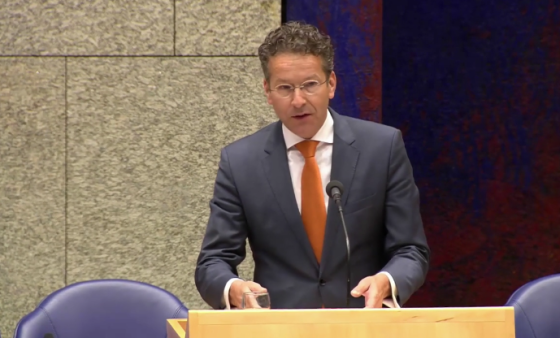 Members of the group decided unanimously on Monday that Dijsselbloem can remain in the job until the second of his two terms in office expires at the beginning of 2018. His replacement will be chosen by the Council of Ministers on December 4. Dijsselbloem, a Labour minister, has won praise for the way he has carried out the job, particularly in his support for an EU banking union, according to the NRC. He has also faced calls for his resignation after last year telling a German newspaper that there is a need for budgetary discipline among the member states in the Eurozone. ‘I cannot spend all my money on drink and women and then ask for help,’ he said.